This Sunday, soda lovers will have the choice of two different limited edition packs. 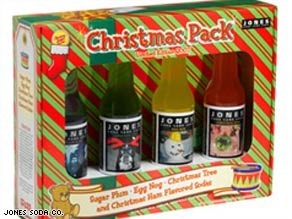 First, you can go with the Christmas pack, including the ‘favorites’ of Sugar Plum, Christmas Tree, Egg Nog and Christmas Ham. For those that celebrate Hanukkah, do not despair! You too have your very own pack this year: Jelly Doughnut, Apple Sauce, Chocolate Coins and Latke. I’m thinking I might temporarily convert, because those flavors look better. While I might put Sugar Plum up against Apple Sauce, you’ve got to agree that Christmas Tree is probably beaten out by everything. Feel free to pick some up at their online store, because it’s not likely your local Shop and Save is going to have them. 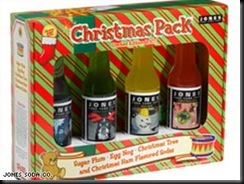 This entry was posted in Odd and tagged christmas, ham, hanukkah, holiday, jones soda, soda, turkey by Weezel. Bookmark the permalink. I love spruce beer – I wonder if Christmas Tree tastes similar!